During the 1970s, Nelson’s Notre Dame University faced accumulating financial and administrative problems. Jun. 26, 2016 7:00 p.m.
During the 1970s, Nelson’s Notre Dame University faced accumulating financial and administrative problems. Enrolment peaked at nearly 640 full-time students in 1970-71, then declined. Recognizing its increased need for revenue and its more diverse faculty and student population than at its Catholic origins, the university in 1970 requested and began to campaign for public status. As former NDU faculty member and historian Dr. Ernest Epp observed, the major factor in the university’s soon-to-be-declining enrolment was the province’s new regional college system, particularly Selkirk College nearby at Castlegar. Established in 1968, Selkirk College started to offer academic transfer courses at the first and second year level in competition with Notre Dame. Tragically, Selkirk College also became a centre of opposition to Notre Dame University’s going public. But the provincial government refused to act on the recommendations. By the spring of 1975, after the decline in enrolment and mounting costs, Notre Dame University was in crisis. Father Aquinas, the longtime president, resigned in 1969. The next appointed president, Dr. Cecil Kaller, fared no better in solving the university’s financial and administrative problems. He too was forced to resign. 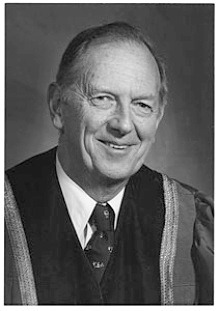 In November 1975, the Barrett NDP government attempted to close the university, though its action was interrupted by the efforts of local MLA Lorne Nicolson, and a provincial election that brought to power the Bill Bennett Social Credit government. However, the new government was even more adamant about closing Notre Dame. Notre Dame tried drastically to cut programs and faculty to save its university status. It dropped teaching first and second year courses in a concession to Selkirk College, and cut many upper year courses. The university faculty complement, once near 60, was reduced to about two dozen. The future of the university was dark. At the heart of the academic life of the institution, the Notre Dame library, there was trouble. By now the library contained some 60,000 books. It was a collection acquired over 25 years, and had shown itself substantially adequate to the needs of the students. Now its future was at stake. If the university would close, what would happen to the books? Interestingly enough, in the year or so before the ship Notre Dame was sunk, one could observe some furtive activity in the library. The process of weeding had increased. Books were being discarded, withdrawn and removed from the library at an unprecedented scale. Everyone knows libraries must be weeded from time to time. This is normal. But what was happening now was something quite different. Whole sections of the library were being confiscated. Particularly hard hit were the foreign language sections of the library, such as the Russian, Spanish, and German collections, and even the French collection. It is hard to understand why these valuable collections had to go, or why they had to go first, but those who were here when it happened know that it did happen. The Russian collection suffered the first and most pitiful fate. One noon hour in late spring 1975 it was pulled from the shelves and laid out for sale on tables outside the library entrance. During the lunch hour and no one was there to guard it, as luck would have it, a rain squall drenched the entire lot. There was nothing more to do than to take the pulpy mess to the garbage dump. I witnessed what happened to this priceless collection of books which had over the years been donated by local citizens of the area and gone to waste. The Spanish collection was picked up by the director of the Spanish language department, who, I understand, took it along with him when he moved on to a new college position in Alberta. The German collection was on its way out the back door of the library when I spotted it. I did not wait for a moment to make enquiries, but quickly brought my car to the door and conveyed the entire collection home. The French collection was spared an ignominious fate. By this time the faculty of Notre Dame had been sufficiently enraged by the removal of books that they rose in protest. “French is not a foreign language in Canada,” they cried. “I have space for these books in my office,” one member shouted. There was such a fuss, especially over the removal of the French books, that in the end these remained in the library. The erosion of the foreign language collections was only the beginning of the troubles of the library. More strife and destruction was still to come. Dr. Arthur Bartsch, who received his PhD from the University of Chicago, taught history at Notre Dame University and David Thompson University Centre. In the years since he has been a leader in efforts to protect the university library and re-establish a university in Nelson. He has worked and lived in Nelson for over 50 years.